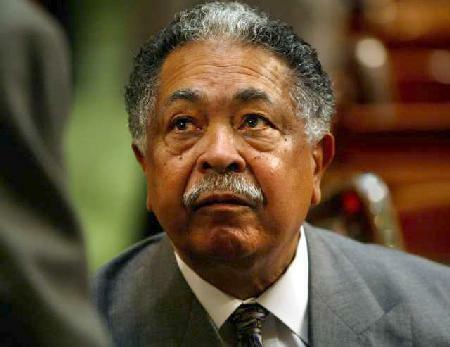 *(Via LA Times) – Mervyn M. Dymally, the Trinidad-born former teacher whose ground-breaking if sometimes-controversial political career spanned more than four decades and included a stint as California’s first and only black lieutenant governor, has died. He was 86. Dymally, who became a leader in the Los Angeles area’s ascendant African American political establishment in the early 1960s and served in both houses of the Legislature and in Congress, died Sunday in Los Angeles, after a period of declining health, his family said. “He’s opened so many doors. A lot of people have walked through those doors,” then-Assembly Speaker Herb Wesson told The Times in early 2003, shortly after Dymally, a decade into his retirement from Congress, returned to the Assembly as its elder statesman. Wesson, now a Los Angeles City Council president, was one of several generations of area Democratic politicians mentored by the man with salt-and-pepper hair and lilting West Indies accent. Read/learn more at LA Times.